As we made our way to ORD, fully prepared to act surprised when World Strides announced that we were going to Italy, we tried to keep up hope that there would still be some mystery to the trip. Would we spend all of our time in Milan, given that the Milan embassy sent all of us emails the previous week? Would we spend time in Switzerland or France as well? Regardless of where we would end up, each of us was excited to spend a week with a cohort of 17 other mystery seekers who had proven they can hold their own in a shot glass throwing competition. Then, we were handed a gift. We found the World Strides rep and she informed us that we would spend a week in Slovenia. A look of excited confusion came across all of our faces as we prepared to step foot in a country which, in the previous day, we barely knew existed. 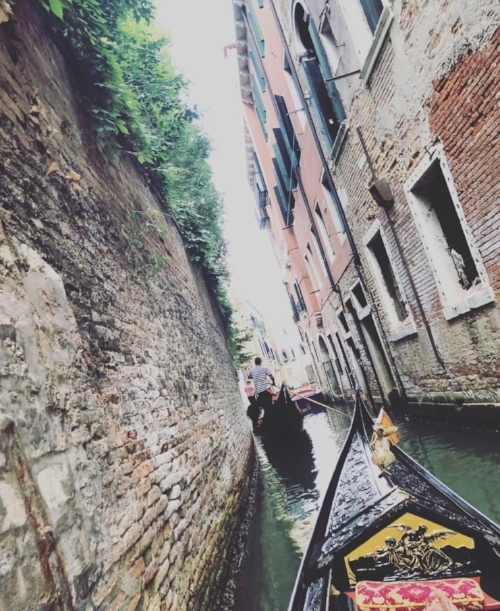 We endured our grueling flights to Amsterdam and Venice, without sleeping, met our eccentric guide, Janez, and boarded our private coach bus to luxuriate in excess space while Janez lulled us to sleep discussing the Italian countryside in his soothing voice. After the 2-hour bus ride, we finally ended up in Ljubljana. Ljubljana was a beautiful, romantic city in the heart of Slovenia, with some of the most walkable streets. Janez gave us a tour of the city while we snapped photos and pretended we were listening. We took in some fantastic views over the Ljubljanica river and began to stake out our spot for that night. The winner was a quaint and romantic wine bar, into which 18 of us stormed, rearranging tables and ordering beer and negronis. We decided to call it an early night, as we hadn’t slept much and had a full day of activities in paradise ahead. On day two, we toured Ljubljanski Grad, a medieval castle complex sitting above downtown Ljubljana. For lunch, we explored the local market and some of us indulged in “Melania Apple Pies”. That night we arranged a group dinner at an Italian restaurant and I brilliantly decided to introduce the game “What are the odds” to the group. This game is an easy way to make your friends perform foolish tasks and it led to us chugging copious amounts of wine at dinner. This spilled into our night at a local “club” where No Scrubs by TLC was played at least six times. The next morning, waking up for breakfast was a struggle. However, there was solace in the fact that we were all struggling equally. We then made our way to Lake Bohinj to go canyoning in Jerečica. Putting on our wet suits was not so pretty as none of us actually fit inside our suits, none of us felt great to begin with, and the sun was beating down hard. As soon as we made it into the water, we realized everything was going to be okay and we ended up having a great time. We couldn’t leave Ljubljana without one more lake stop. We spent our final half-day in Ljubljana at Lake Bled touring the Provost’s House and the Pilgrimage Church of the Assumption of Maria. We then boarded our private coach and headed south to Portoroz, making a stop at Vinakoper, a winery in Koper. We were amazed at the prices of wine bottles at the gift shop, roughly 4 euros for high quality bottles. We bought all that we could possibly carry, a move we would later regret. That night, we enjoyed a nice seafood dinner and found another local “club”; but this time No Scrubs was not played. This time the morning struggle did not matter, because we had the entire day to relax in our private section of the hotel beach. 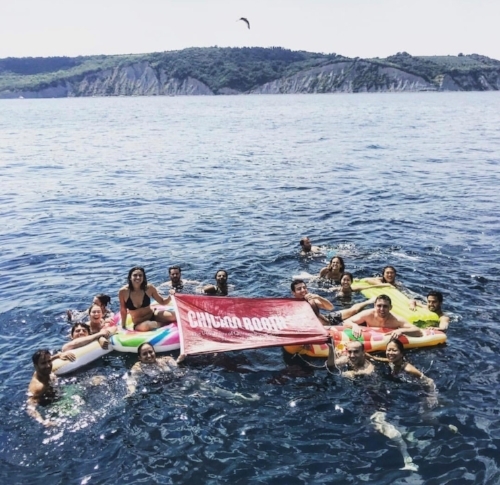 We enjoyed some R&R, floated in the Adriatic, and embarrassed ourselves on banana boats. To keep up with the theme of spending every day on the water, we started our final full day in Portoroz on a private pirate boat, or cargo vessel, or whatever. This boat stopped in a nearby coastal town by the name of Piran and our fearless leader, Janez, gave us a walking tour of the romantic town. The boat then took us to the middle of the Adriatic Sea, and we enjoyed some time to ourselves. To close out our final night in Slovenia, we decided to stake out on the beach and attempt to finish all of the wine we had purchased. We failed miserably, leaving most of the unopened bottles with hotel staff the next morning. Gondolas, Apertifs, and Hors’ D'oeuvres; Venice treated us well. At this point, we were headed to Venice for a half-day. When we arrived in Venice, we held back tears saying goodby to Janez. We then met Monica who took us on a 3-hour – that’s right, 3-hour - walking tour of Venice on a 90 degree, humid day. Following the tour, we embarked on Gondola rides with snacks and aperitifs, and had a close out dinner, in which we discussed trip highs and lows. Leaving at Venice at 3 am to travel for the next 18 hours did not seem ideal, but I would not have changed anything. Again, we all rode the struggle bus together and had new memories with new best friends to look back on for the rest of our lives. None of us would have ever thought to visit Slovenia before this trip, but now we had a common bond that not many others can talk about.